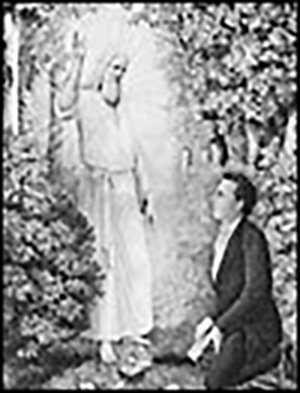 Illustration of the angel Moroni and prophet Joseph Smith. Program interviewees describe the church's origins in a part of New York State where religious revivalism exploded in the first part of the 19th century. There was so much evangelical fervor in the region at the time that it became known as the "burned-over district." "How did Mormonism distinguish itself in such a crowded field?" asks professor Terryl Givens. "There were many people who claimed revelation from the heavens, who claimed prophets, who claimed to speak with the same kind of oracular voice." 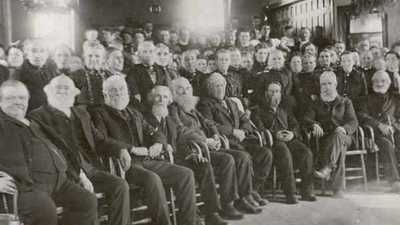 Read more about the church's founding in these interview excerpts. "There was an extraordinary difficult and confusing social period in the first half of the 19th century, where religious ferment was everywhere. We are just, I think, at the end of a great awakening ourselves, in which religious creativity, religious involvement in areas of life we never thought of as possible has occurred all around us, so we can get a sense of the excitement that must have been in the air in the 1830s when this new prophet appeared and galvanized audiences. Those piercing blue eyes, that amazing new scripture and what Mormons and the Church of Jesus Christ of Latter-day Saints did was turn this brand new revelation and the existence as a small very cult-like sect into a flourishing and worldwide religion..."
"Joseph Smith and his visions came out of what religious historians have called the "burned-over district" -- burned over by endless revivals -- the 1830s in the Western reserve of New York State. A very distinguished historian of American religion, John Butler, I think, originally described this as a "spiritual hot house," which I think is a very good way of putting it. All kinds of new faiths and schisms were arising, but none of them had the enormous potential for explanation as to why there was so strong a need for salvation and a means for accomplishing it. Smith denied original sin. He insisted that original virtue still prevailed. He was... an amazing charismatic. He had a kind of magnetism. He had that curious kind of aura that so frequently attends political and spiritual leaders, that we so frequently associate with figures in entertainment. He also had amazing energy. He was a kind of prodigy of nature. He was an almost uniquely endowed individual. He was relatively without formal education. He was a kind of furious autodidact, but he had tremendous capacities for rapid absorption and a real gift for converting it into a vision of his own. And he had staying power, which most of these other figures simply did not have at all. If you are a sociologist or a historian of religion then I suppose you would try to explain it, as they frequently do, by a man, a place, a time, a situation coming together -- but that seems to me very inadequate with a personality and a will as unique and strong as Joseph's. It seems feeble to fall back upon the now, for so many people, discredited category or characterization of "genius." But if Smith was not an original religious genius, then it's very hard to think of anyone else in the history of the United States who could usefully and accurately be called that." "One of the ways to think about... the post-1815 period is that that's when it becomes clear that the United States really isn't a candidate for recolonization. It's going to survive. It's going to expand. The implosion is what everybody's worrying about, but it's actually pretty distant, and there's a sense of experimentation across the board. Migration, faith, economics, politics -- so in that sense, the way that Joseph unified all those things in his own person, and with this new faith, is the epitome of the age. ...In a world in which almost everyone has a multitude of religious messages to pick from, there's a way that being startlingly creative, pushing the edge attracts attention and attracts followers to a faith that in another period might look bizarre, but is attractive because there is so much else going on. We think of it as a prepared audience. These people were ready to receive a strong, new, disturbing message, even. One that overturned many assumptions they had about the world..."
"Mormonism is often seen by religious historians as a part of a larger restorationist movement. The Churches of Christ, it's called the Stone-Campbell movement in the United States. There were a lot of groups in the 19th century that talked about restoring primitive Christianity -- early, early, going back to the early church. But they tended to go in a direction of, really, simplicity. Let's throw all these creeds aside and let's get back to the simple practices of having a meal together, the sacramental meal together, and hearing some teaching, and fellowshipping together. Mormonism in part identified with that, but they went further and they actually put in all the complexities. I mean, they brought in robes and they brought in temples and they brought in all these ceremony -- rituals, that was foreign to the rest of that restoration movement. And actually, they came a little later in the process. In the early stages you can see Joseph Smith simply calling for a kind of simple, primitive Christianity. But as the restoration of priesthood and the introduction of temple rites and the like came into being, it became a very complex religion. And in many ways that restoration was the restoration of some of the rites of ancient Israel. ...This founding story is really the first truly American-born religion. It's a religion that provides a theological understanding of America. When it talks about the origins of America it doesn't go where I go -- and that is to the Puritans and then on to the Founding Fathers. 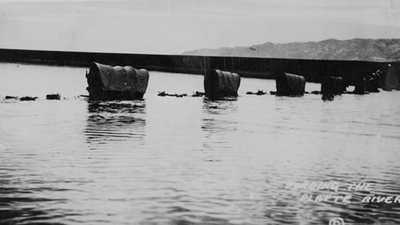 It goes way back to the native peoples as a displaced tribe of Israel -- or tribes of Israel -- and a place that Jesus visited. It gives an understanding of the American experience that's very different than all of the other stories of America, and it makes that story the founding story of a rather comprehensive religious perspective on the universe." "The Book of Mormon is not easy reading. I think at one time or another, I have read every sentence of it, but I have never been able to read it consecutively from beginning to end. But it does have one wonderful high point, which is itself an act of genius on Smith's part. Christ, after the resurrection, suddenly appears in the American wilderness. There is a full epiphany, or manifestation, of Jesus there, surrounded by the tribes of the Native Americans, as we call them now. That vision of Christ in the American wilderness answered a deep need on the part of Americans, because no longer was religion a European importation, no longer was it an affair of ancient Palestine. The actual epiphany had taken place on the American frontier. And that was, itself I think, part of the impact of the Book of Mormon upon Smith's contemporaries." 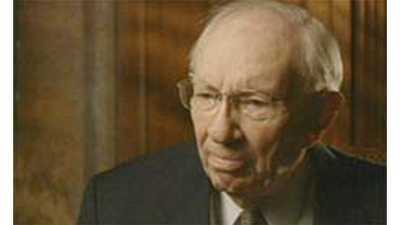 Gordon Hinckley was the 15th president of the Church of Jesus Christ of Latter-day Saints. He led the church from March 1995 until his death in January 2008. This is the edited transcript of an interview conducted in January 2007.